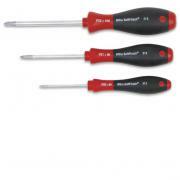 Detailed listing of our screwdriver sets. Wera's precisely ground and etched laser tip, "bites" into the screw head to prevent slippage. Forged of chrome vanadium steel for long service life. Ergonomic, Dual-Material Handles for tough and comfortable all-day turning! Only the best in German-made Quality and craftsmanship. 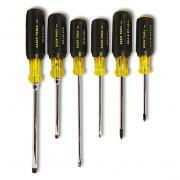 Klein 6-Piece Cushion Grip Set includes four slotted screwdrivers and two Phillips screwdrivers. 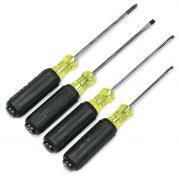 Klein 4-Piece Cushion Grip Mini Screwdriver Set includes three small slotted screwdrivers and one small Phillips screwdriver. Many standard American and European screwdrivers don't fit well in screws used in overseas products. Pick up a set of these and make your life easier. 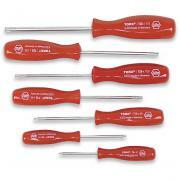 Pozi-Drive fasteners are similar to Phillips but require Pozi-Drive screwdrivers to avoid damage to screw head. 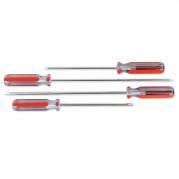 3-piece Pozi-Drive set includes: PZ#0, PZ#1 and PZ#2. Guaranteed replacement for any failure. Overall length 6 1/2" to 8 1/2". 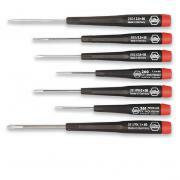 These Heavy-Duty Screwdrivers from Wiha feature a hex collar to apply extra torque with a wrench, ergonomic soft finish grips and premium Chrome-Vanadium-Molybdenum steel shafts. Heavy-Duty rubber grips and hex collar on shaft allows you to apply maximum torque. 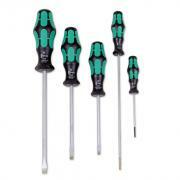 Insulated screwdrivers with ergonomic cushion grip handle from Wiha, one of the most trusted names in hand tools. 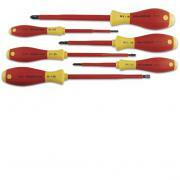 Insulated screwdriver set from Wiha includes 9/64", 3/16" and 1/4" slotted and 1, 2 and 3 Phillips. Each tool is tested to 10,000 volts. High quality with hardened steel tips and comfort style handle. 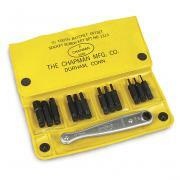 8-piece TORX® set includes: T5, T6, T8, T10, T15, T20, T25 and T30. Guaranteed replacement for any failure. Overall length 4 1/2" to 8 1/2". TORX® is the registered trademark of Textron Inc. This precision 6 piece ESD combination set includes spin tops, great for one handed use. 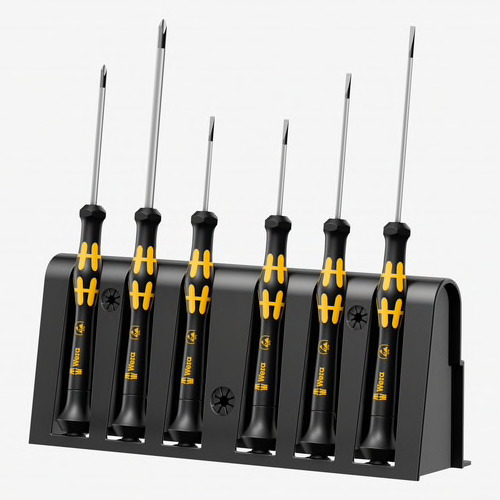 This precision 6 piece ESD combination set includes: Precision Phillips Screwdriver: #0 x 60mm, Precision Phillips Screwdriver: #1 x 80mm, Precision Slotted Screwdriver: 1.2 x 0.25 x 40mm, Precision Slotted Screwdriver: 1.5 x 0.23 x 40mm, Precision Slotted Screwdriver: 1.8 x 0.30 x 60mm, Precision Slotted Screwdriver: 2.5 x 0.40 x 80mm. Spin top makes these great for one handed use. This precision 7 piece combination set includes: 3 Phillips sizes; #00, #0, #1; and 4 slotted sizes; 1/16, 5/64, 3/32 and 1/8. Spin top makes these screwdrivers great for one handed use. 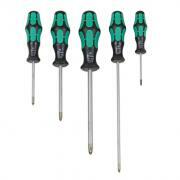 6-piece TORX® set includes: T6, T7, T8, T9, T10 and T15. TORX® is the registered trademark of Textron Inc. The most versatile screwdriver you will own! Use by hand or with your powerdriver. Includes ratcheting handle and Skewdriver offset head. Lifetime Warranty. 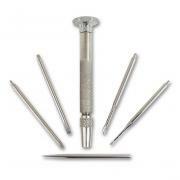 Kit includes: the patented Skewdriver right angle head, removable ratcheting handle, 4 1/2”, 1 1/2” magnetic extensions, Phillips sizes #0, #1, #2, #3 , slotted sizes: 1/8”, 3/16”, 1/4”, 9/32”, Torx sizes: T8, T9, T10, T15, T20, T25, T27, T30, hex sizes: 2mm, 2.5mm, 3mm, 5mm, 5/64, 3/32, 7/64, 1/8, 9/64, 5/32, 3/16 hex socket sizes: 3/16 (5mm), 7/32 (5.5 mm), 6mm, 1/4, 9/32 (7mm), 5/16 (8mm), 3/8, 10mm, and square recess sizes:R0, S1, S2, S3, hex adapter. These miniature tools are big in strength yet small enough to get into those tight spots. High quality steel ratchet holds any one of the many hardened steel bits. 27-piece set includes a ratchet, driver handle, extension, 11 Allen type hex bits (.050”- 1/4”), five screwdriver bits (3/16", 1/4", 3/8" slot and #1 & #2 Phillips), 1/4" square drive adapter and seven metric hex bits (1.5mm-6.0mm) in a rugged plastic case. 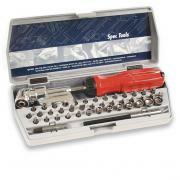 20-piece set includes a ratchet, driver handle, extension, 12 Allen type hex bits (.050”- 5/16”), four screwdriver bits (1/4", 3/8" slot and #1 & #2 Phillips) and 1/4" square drive adapter in a rugged plastic case. 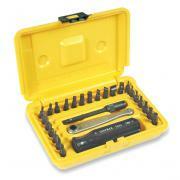 13-piece set includes a ratchet and 12 Allen type hex bits (.050”- 5-16”) in a convenient soft-pack vinyl case. Spin top allows one handed use. 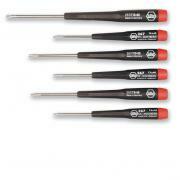 Set of six precision slotted screwdrivers with replaceable blades. Sizes .025", .040", .055", .070", .080" and .100". 5pc. 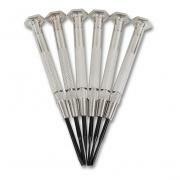 Jeweler’s Screwdriver Set includes interchangeable Phillips and slotted blades arranged in a convenient pouch. Precision Spinner Top Handle with .040", .070" and .100" slotted, #0 Phillips and a scratch awl blade included. Made in the USA Bit holder is designed to accept any 1/4" hex bit. 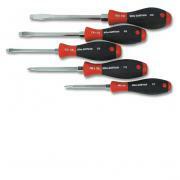 Includes 15 degree offset ratcheting handle and 4 bits.